Jim Sweeney was born in 1923 in New York about a year after Louis Armstrong moved to Chicago to join King Oliver and his band. So he would have been a wee lad when Armstrong released his Hot Five and Hot Seven recordings. But that didn’t keep him from digging them. 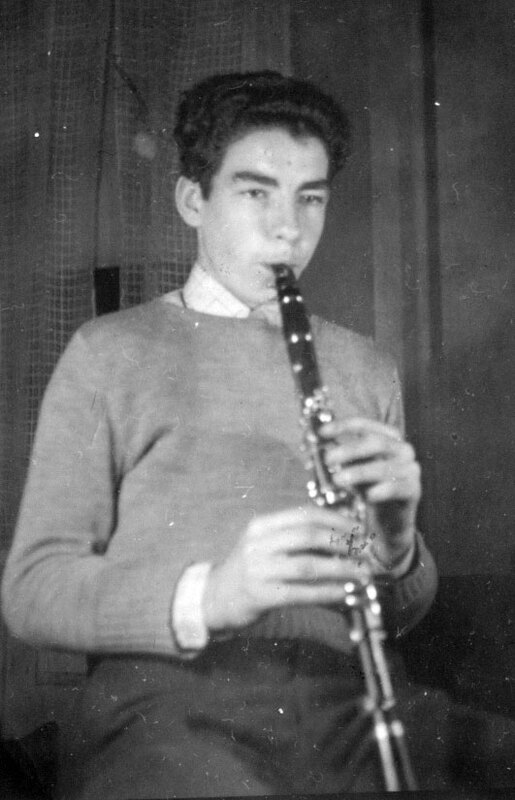 While he held a lifelong passion for Armstrong, it was likely Glenn Miller and his way of using reed instruments to carry the melody and Benny Goodman who most likely inspired him as he came of age playing the saxophone and clarinet in the 30’s. My musical foundation was solidly laid by Dad’s love of music, his stereo and his collection of swing, jazz and big band records. His taste in music became the soundtrack of my childhood. I wouldn’t have been born in New Orleans if my Dad hadn’t taken a teaching post at Tulane in the 50’s. As someone who once played with the Tommy Dorsey band, albeit briefly, he must have thought he hit the jackpot when he got that job. 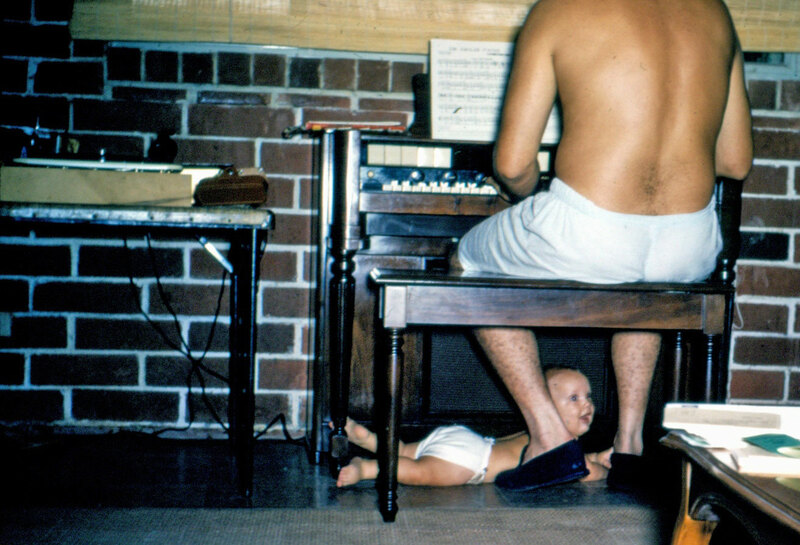 My Dad (and me) at his organ, next to his record player. Later, he would create a wall niche for the organ and shelves for his records and player. He also added central air conditioning but he still walked around the house in his briefs. But by then, his clarinet was packed away. 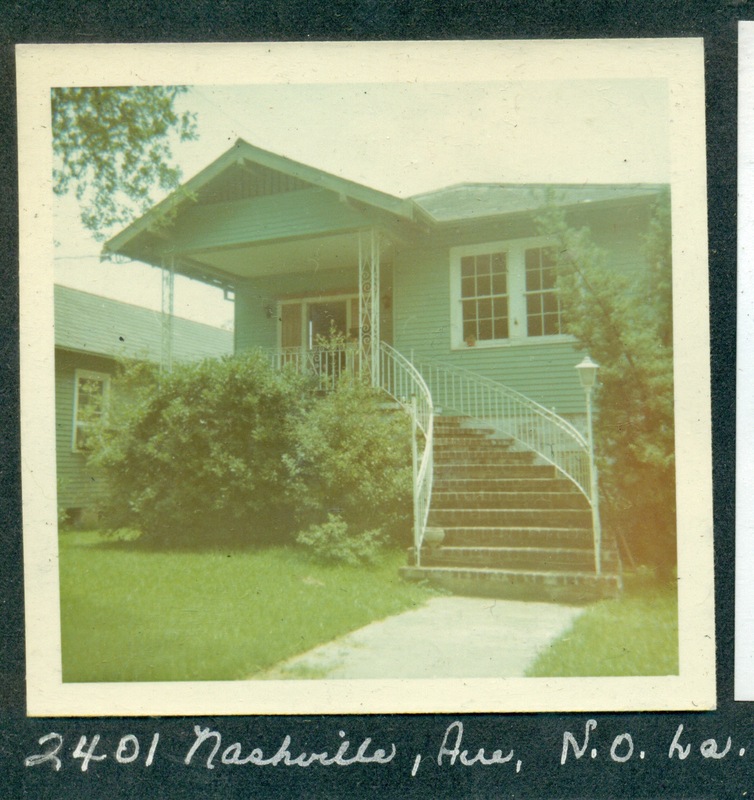 He bought an organ instead and remodeled the downstairs of our house on Nashville Avenue, just a few blocks from Freret. There he and my Mom would hold parties, digging deeply into his music collection and inevitably ending up playing the organ or having others play and people would sing and dance. He was a fan of local musicians like Pete Fountain and Al Hirt, and a frequent visitor to their Bourbon Street clubs as well as a new spot called Preservation Hall. My Dad’s career blossomed in New Orleans allowing him to get to know a wide range of people, particularly those active in labor and justice issues. As a result, our downstairs parties became a safe haven for activists such as Loyola faculty members Louis Twomey and Joseph Fichter, Jesuit priests and academics who played a key role in school integration. Other visitors included the poet, John Beecher (“To Live and Die in Dixie”), the journalist John Griffin (“Black Like Me”) and, so I’ve been told, the Singing Nun. We lived in Uptown New Orleans where my Dad remodeled the downstairs with a big room designed for listening, playing and dancing to music. I was too young to absorb most of this. But I did soak up the music. After we moved away from New Orleans, my Dad still loved to listen to hot jazz and swing but it wasn’t quite the same. This Monday, I’ll be spinning a lot of music my Dad played in his day and perhaps would have played had he had the chance. Please join me. Happy Father’s Day.